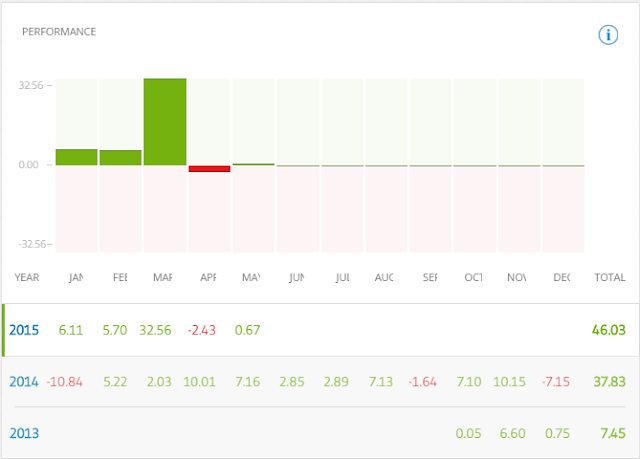 I'm about 2 months into my eToro experiment. Basically, it's an opportunity to test trading strategies in a live market environment without exposing myself to large capital losses. What I like is the selection of leverage choices (most of my trades use x5 to x10 leverage, stocks are x1) and the low initial sums which can be risked; for example, you could make a $10 bet on the S&P at x 5 leverage. You can of course risk (much) more and leverage higher, but that is not the purpose of this account for me. Those of you outside of the U.S. can also automatically follow my trades if they wish by copying my account. My performance stats are okay, although I should add, the performance from 2013 to Feb 2015 was down to Apple stock alone! My active trade management covers March and April. 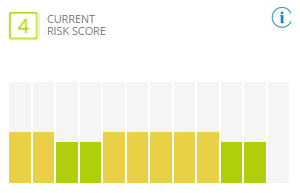 As I have intended, my trade risk is low, scoring 4 out of 10 (lower score => lower risk per trade). And since taking over the active management of the account, the number of copiers I have has finally got off the mark. 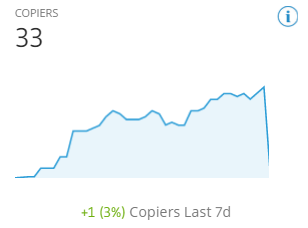 I got my first copier in March, although this was the helped by the fact I was the second most profitable verified trader on their platform for March, gaining me followers and copiers. The raw trade stats do point to my preferred system of micromanaging a trade to a point I can safely move the stop to breakeven (or close too), then letting the profit run; trailing stops using key swing lows. This results in a relatively large number of losing trades, but the overall loss for each trade is kept small. 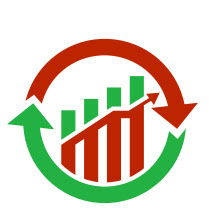 In effect, a third of my trades are winners with an average return close to 14%, two thirds are losing trades with a loss close to 4%. The one caveat is that I'm harboring a 19% loss on TWTR, but I think this is a stock which will make back lost ground as it's too attractive as an acquisition target, but eToro lists all of my open positions and closed trade history, including gains and losses. I trade all asset classes in my eToro account, but this account is used more for indices and FX, particularly as it helps with the work I do for Tradercast (join me every Friday for my broadcast from 13:30 GMT, 8:30 ET, for 2 hours). It's easier to understand the standpoint of Tradercast members who have active positions, if I have a position myself. Trading is a solo activity for many, but for those who are looking for a more social set up, and exchange of ideas as part of their trading, then please join Phillip Konchar and I on Tradercast. 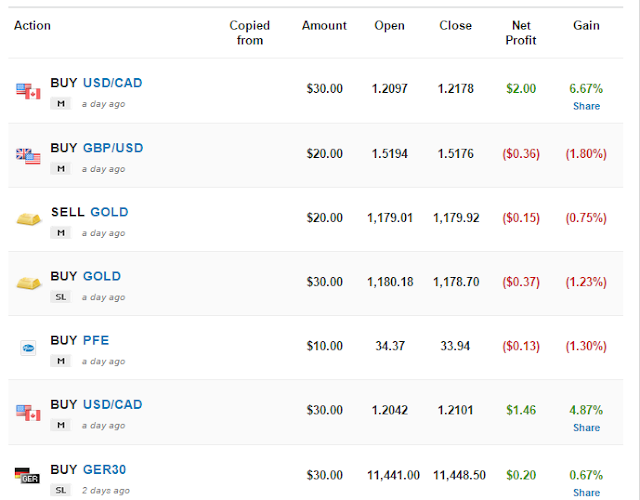 Back to eToro... below is a sample of my trades from last week. I usually try to do one-a-day if I can. But once I have 3 positions (stocks exempt) bubbling in profit then I look to manage those positions before taking on more. Stocks I tend to hold for longer, use no leverage, and therefore require less management; indices and FX trades work on shorter time intervals, and are more prone to bigger losses if left unattended for long. Best trade of the week (well, 8 days...) was a Gold short. 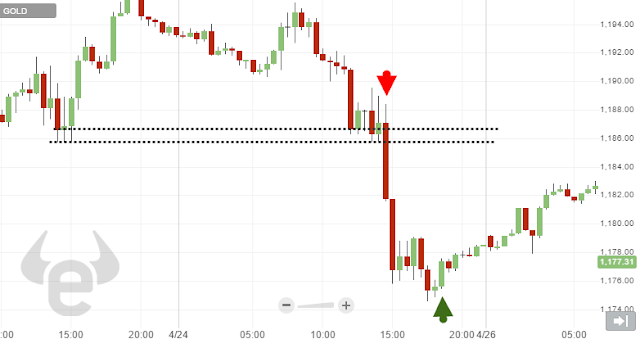 At the time, gold was struggling after a break of a swing low at 1,198 the day before. The rally the next day took it back to test this level, but then faded back towards the low. When I saw the bounce struggling at this low I took the short trade. I kept it with the intention of trailing a stop, but when it reversed to push above 1,176 when the easier path looked to be further losses, I covered. One of my current open trades is also in Gold. I took the trade on Friday when it looked like 1,170 was going to hold on as support. Critical for next week will be closing above 1,178.70s, as shorts will be under no pressure to cover until this happens. 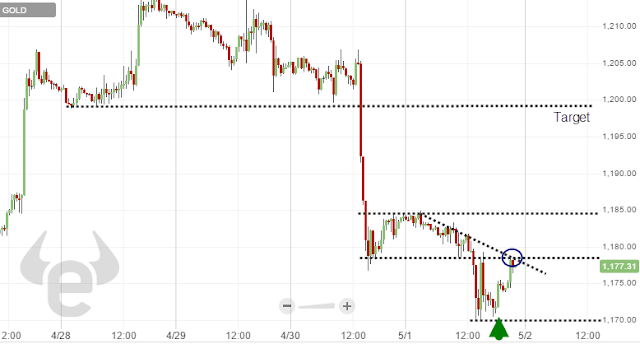 At that point, I will be looking to short covering momentum and fresh buying to bring it above 1,185 and into the lightly traded zone towards my desired Target. My stop is on a loss of 1,170. 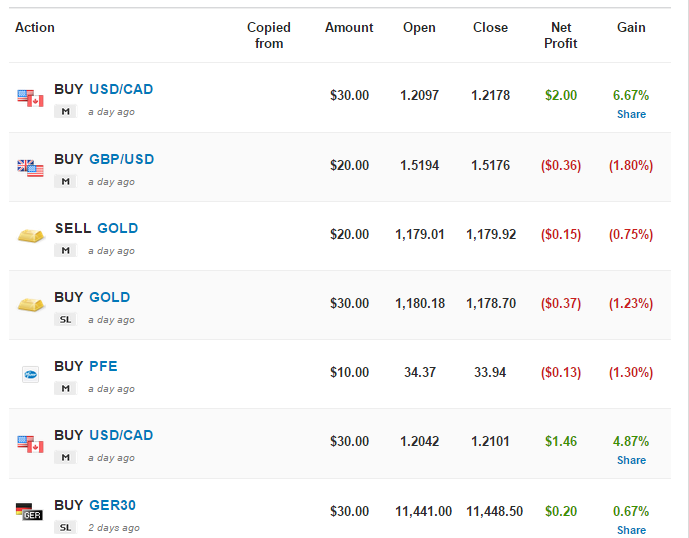 If you are interested in my trades, and would like to copy my other trades, open an eToro account and copy me.